If you are like me and love colors you will be amazed with this kit! 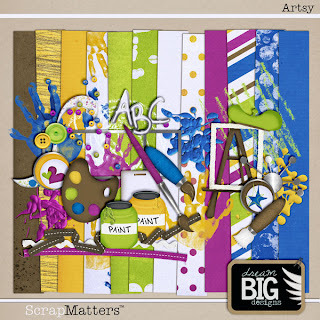 It's a new kit called Artsy by Dream Big Design and you can get @ ScrapMatters. For this page I used a template from Cluster Queen Creations. Jag tänkte bara berätta att du är en av fyra nominerade till "Månadens Scrappare - Juni" hos oss på Scrapbooking i Fokus.